Our Month-End Close Ensures Your Financial Information is accurate and up-to-date. A CEO’s main focus is running the company and selling services or products - not handling the daily bookkeeping or managing an accounting department. Yet, financial statements are critical for a CEO to understand the financial health of the organization and to be able to make decisions in a timely manner. So, how does a business mind the gap? To reach the point of financial reporting, many details must take place throughout and at the end of a month in order to record the financial transactions of the organization. All of these details can be managed most efficiently when processes and procedures are put into place. GrowthForce follows a disciplined month end closing process, which ensures the management reports reflect the true monthly economic results for the company. This process includes working with the CPA or CFO to define revenue recognition policy, along with accruals to record incurred expenses to earn that revenue, and reconciliation and preparation of work papers for every balance sheet account every month. The benefits of this service are financial reports that you can use to make decisions, and work papers to back it up, which also supports your CPA in his or her role. By leveraging Team, Technology and Processes, GrowthForce provides business owners with the ability to make strategic business decisions based on numbers they can trust. 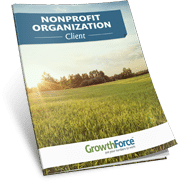 GrowthForce provides timely, accurate financial intelligence for Houston-Based Nonprofit, including restricted funding and Profit and Loss by Class Reporting.